This was such an easy recipe and the sauce is so versatile. I’ve used all local ingredients and was particularly thrilled at the jalapeño-type fat red peppers that are plentiful at the vegetable stalls these days, so gorgeous with their dazzling red colour. I bought a kilo of the darn things just because they looked so pretty and completely forgot about them for a couple of weeks. Luckily it’s winter and the peppers stayed very well in the fridge. Fished them out today before they went bad and made this super easy sauce. There’s so much one can do with these amazing peppers including make a stuffed Indian chilli pickle and also pickle them in vinegar. You will only see the results on the blog if it all goes well. I’ve kept the sauce very mild and tangy so that the brats could also consume it. There’s no added chillies of the hot variety, and with the seeds removed from these peppers you only get a fleeting hint of spice. The extra onion further reduced the heat. Less chances of severe heartburn! If you want it hot and spicy, add one or a couple of thin red chillies, or birds eye chillies to the sauce. 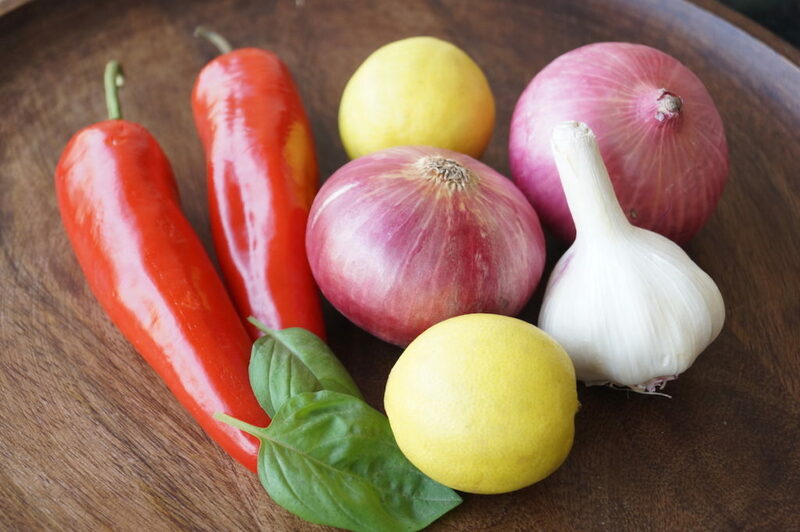 You can use this as a pasta sauce or flavouring for chicken or fish or vegetables or as a sauce for appetisers such as poppers like these sweet potato croquettes or shrimp or even vegetables. Go wild. I’ve used dried herbs for this, but one can also use fresh basil. I made a pasta with the sauce today and my daughter, who usually takes about two or more hours (I kid you not) to finish a meal, ate it in record time and actually asked for seconds! I guess that’s a score, and also testament to the mildness of the dish. Wash the peppers thoroughly and dry them with an absorbent napkin. There should be no water on them. Then cut the stalks off and split in half removing all the seeds and chop roughly. Put the chopped peppers in a mixie (blender) and whack till it becomes a paste. Add the garlic and chopped onions and whack till it all blends together. Add the salt, oregano, basil, lemon juice, vinegar and oil and blend some more till it becomes a nice smooth paste. There should be no lumps. Taste to see if you’re happy with the seasoning and flavour. 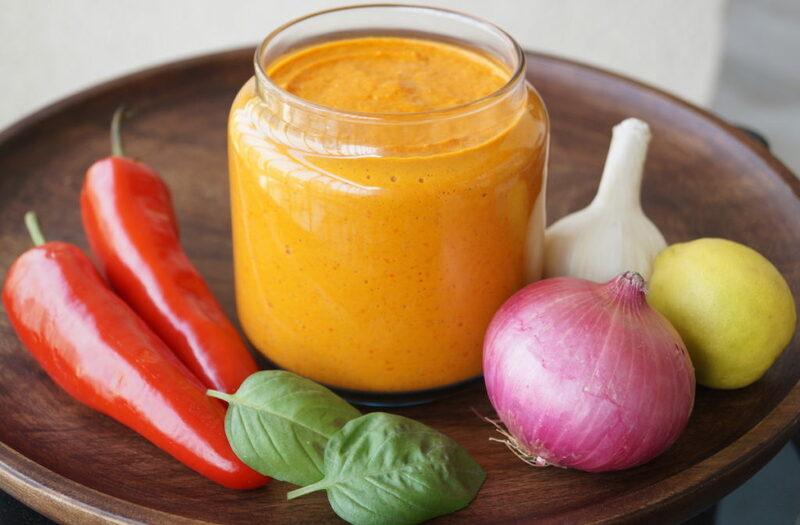 Pour the sauce into a clean and dry airtight glass jar and refrigerate. Important notes: There should be absolutely no water on the peppers when they go into the blender. Water in the sauce will lead to it getting spoiled very soon. 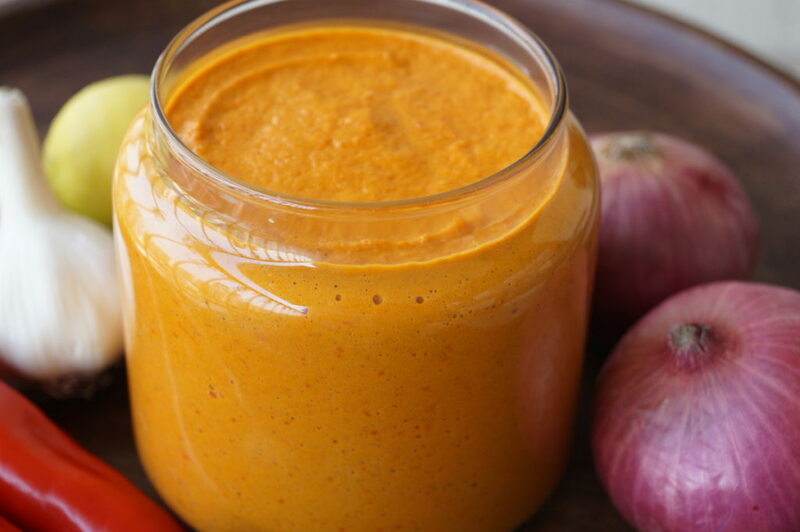 This sauce will easily last a month or more in a well-cooling refrigerator. I used small Indian limes which are way more sour than lemons. Add your ingredients according to your own preferences.